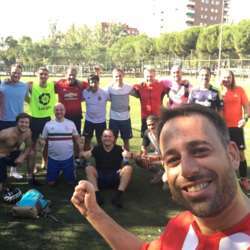 If you are in Madrid and willing to play some football, this Saturday we'll have our weekly InterNations Madrid Football game! We have players with different skills, levels and ages, so don't hesitate to join! We have 2 hours available, so depending on the number of attendees we will play with two or more teams. In case needed, we'll use the King's Court system to play. As a courtesy for the rest of players, sign up only if you are 100% sure to attend and PLEASE be there at least 10 minutes before the game starts.